Being very proud of their massive fan-base, their huge stadium and their trophy laden history, Barcelona fans are keen to boast that theirs is “more than just a football club”, meaning the club has been a political symbol for the Catalan people since Franco’s early dabblings with ruthless suppression. 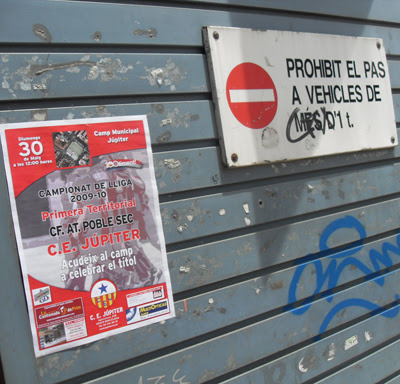 However, in the wake of this spirit of romantic rebellion against the fascist command, it might be easy to lose sight of the fact that Barcelona, the city, contains more than just one football club. 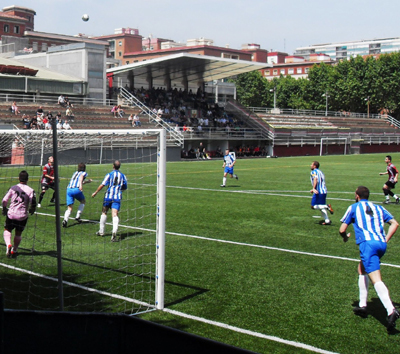 In addition to fellow top-flighters Espanyol, the city plays host to a number of small football clubs located in the districts dotted around the main bustle of the city centre. 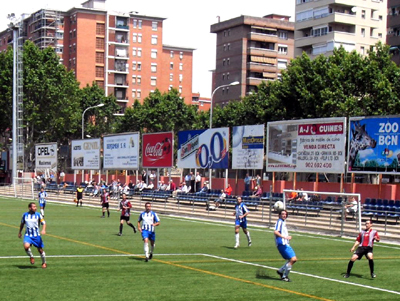 A great many of these teams play in the regional divisions at the 5th to 9th levels of Spanish football that cover the Catalonian expanse. The Primera Territorial de Catalunya is at the seventh level of the pyramid and comprises six groups of eighteen teams which are arranged geographically to cover the cities of Barcelona (3 groups), Tarragona, Girona and Lleida. One of the teams in the second group is CE Júpiter, a 101 year old football club who play in the Poble Nou district to the east of the city. Poble Nou has been undergoing regeneration and gentrification for some years, with towering glass-fronted hotels, hefty and angular shopping centres and landscaped public gardens intermingling with streets that are a little more traditional and tumbledown. The football club appear to be equally as upwardly mobile with this final game of the season representing an opportunity to celebrate their wrapping up of the league title against an Atlètic Poble Sec side only recently assured of finishing outside the relegation zone. 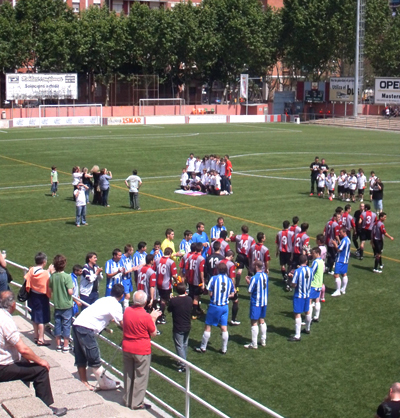 Prior to kick off, a guard of honour built itself at the entrance to the dressing rooms. Not unusual in the circumstances, but out of this tunnel of love came a group of waving ten year olds then a gaggle of teenagers shuffling their feet then a group of parents wielding cameras. Whether or not this was an interpretive dance based on the seven ages of man, or simply a betrayal of the fact that Júpiter have been fielding a 30 strong side of kids and their mums to confuse the opposition into defeat, wasn’t clear at this stage. However, those who had been the guard of honour, then became the recipients of one. Perhaps the initial gesture to their youth sections by the Júpiter first XI was just a massive hint to the Poble Sec lads to not forget a champion team’s traditional rite of passage; that being the wading through a channel of clapping hands. Following kick off, the Poble Sec keeper, a stocky vision in faded pink, didn’t seem to want to treat this as an end of season wind-down, angrily berating a home striker who had gone down screaming like a piglet having it’s tail tweaked. An old boy sat in a plastic community-centre-style chair decided to make like geriatrics at football all over the world and give the keeper a piece of his mind that seemed like the never-ending sentence. In response, the keeper merely blew a few particularly wet kisses, and maintained a regular snippy dialogue with the home supporters stood behind his sticks. The younger of the boys teams assembled behind the same goal with one kid using a cheap megaphone to whip up his squeaking colleagues and get some singing going. This was fine of course, but once they grew bored with this and started to play not one but two games of crushed-Coke-can football along the concrete, I took my leave of their festivities and headed for the knotted hankie and knobbly knee sun-baked peace of the sidelines. After 19 minutes, the home side took the lead, breaking down the left and passing for Ramon to tap the ball just over the line before it is cleared. Handily the linesman was alert and raced back towards the half-way line like a dog-track hare. Over the tannoy came a rolled-R, “Goooooooooooooooooooll, RRRRRRRRRRRRRRRRRRRRRRRRRaaaaamon” that is possibly worn just for us tourists, like a silver suit on a human statue; not that I imagine there are many of us here wielding passports and embarrassed English accents whilst handing over the 2 Euro entry fee. Come half time and the home side were coasting. The tannoy in the interval played Queen’s ‘We Are The Champions’ which only got halfway through the second verse before being brought to an abrupt closure. Perhaps this was a metaphor for what was to come in the second half. Despite the surface being artificial, it still required watering and the pump hose on the half-way line spluttered into life for its opening salvo but with such a back draft that those relaxing in the bolted-on seating on the open terrace were forced to scarper for dry land. Maybe it was this that was the metaphor, as in the second half Júpiter collapsed like an over-dunked biscuit. Two goals in quick succession between the 49th and 51st minutes started the rot, and Poble Sec, having looked toothless in the first half, had a newly sharpened set of dentures on display. Júpiter weren’t helped in the 55th minute by having Poche sent off despite having only been on the field since half-time. They held out for a further twelve minutes before an easy sidefoot shot got Poble Sec their third. Their fourth, which came in the 82nd minute, was virtually identical. By the time of the fifth, with three minutes to go, the home side were making it clear that all this was rather after the Lord Mayor’s Show for them. I imagine their supporters, though, were probably hoping for something a little more euphoric by way of celebration.